And that’s how it’s done. You connive. When a massive wealthy institution such as WVU wants to get someone else, i.e, the taxpayers of Monongalia County, to build for WVU’s use and control and ownership a multi-million dollar baseball stadium (“$16.2 million”), the WVU administration does what comes natural to the unscrupulous: it connives. First, WVU sports took what it could get merely by asking, and since the Monongalia County Commission and West Virginia state legislature were evidently eager to give away the public’s money to the WVU athletic department and the WVU Foundation, essentially, WVU merely asked and a ton of taxpayer money was simply handed over. Surely a period of private conniving preceded the public handout, and then the public conniving began in earnest, so that WVU sports might maximize the already locked-in handout from the public. That irrepressible conniver himself, WVU Athletic Director Oliver Luck, slickly abetted by WVU associate general counsel, Rossi Wiles, put on quite a performance (reported on April 23 in the Dominion Post) in a recent work session with the Monongalia County Commission. All that WVU pushed for was everything, while speciously defining terms and law. WVU pretended that it will have locked-in legal ownership of the baseball stadium, as yet to be built with county and state funds. At that point, the County Commission should have halted discussions and hired a legal firm (to be paid for via TIF revenue), but recall this is a county commission that loves giving away public funds to rich entities so, instead, Commissioner Callen more than happily went along, saying it all sounded good to him! and that WVU was probably even doing the county a favor! because the ballpark was such a worthless multi-million dollar piece of crap that it would be a costly burden for the County to own. Thank you, WVU, for taking our multi-million dollar facility away from us. Director Luck must look at Commissioner Callen and then go laughing to the bank thinking, Where has that kind of official been all my life? It’s like stealing candy from babies. Thing is, it’s not the County Commission’s candy to let be stolen. Talk of the Commissioner being in over his head is beside the point when the Commissioner sounds like he doesn’t have a head. If the county insists upon using its money to build a ballpark facility, it should build a facility that can generate money for the county, or at the very least the county should build a facility that can return its investment of public funds by being sold on taxpayers’ behalf. Presumably the last time anyone checked, Monongalia County was not a subordinate arm of the WVU athletic department and the WVU Foundation, a wealthy private entity that gives millions to WVU sports. Someone should remind the County Commission of that actual fact. It’s also a legal fact. That is, maybe someone should remind the County Commission with a lawsuit. Under proposed terms of the collaboration agreement, between WVU and the Monongalia County Commission, necessary to build and operate the ballpark, WVU would buy the 7 acre land plot for the ballpark (for $2.1 million from Mon-View Development LLC) while the County Commission would approve the TIF District county property taxes and state sales taxes to be used to build the multi-million dollar ballpark. WVU would then manage the ballpark, have first priority of use of the ballpark, and evidently take any revenue generated by the ballpark, and after 30 years of the County providing additional TIF monies in infrastructure support for the ballpark, WVU would own the ballpark outright. Got it? WVU buys a plot of land from private developers, then gets a brand new baseball stadium complete with three decades worth of infrastructure support for free, from county and state taxpayers. The ballpark facility, built entirely by county and state funds will simply be given to WVU to control and use – and even apparently to profit from – for 30 years, after which time WVU owns the ballpark complex outright, and could then keep using it or sell it for its own gain. And hey! maybe by then, in 30 years, the Monongalia County Commission, or the state, will be crooked enough or stupid enough – and who could be surprised – to then buy back the ballpark from WVU for county or state use – even though it was county and state tax funds that built the ballpark in the first place! If at all possible, the scam that is the “Ballpark TIF” should be revoked. Want a TIF plan to build an interstate highway interchange in the area (for “about $28 million“), fine, pass a TIF to provide that public benefit. Interstates are public roads after all. What you don’t do – that is, if you are not a crook – is pass or administer a TIF plan to build and give away a multi-million dollar ballpark for wealthy and/or private entities like the WVU Foundation and the WVU athletic department to use and profit from and then even sell for additional profit – all at public expense. Failing revocation of the “Ballpark TIF”, the proposed collaboration agreement that WVU brought to the County Commission should be torn up. The Monongalia County Commission – which approved the TIF in the first place – should write the collaboration agreement itself, on terms that benefit the taxpaying public, and if WVU doesn’t like those terms, then WVU can go build its own stadium with its own dollars. WVU can even go build its stadium in another county – if it dares face the wrath of public opinion and public action for such retaliation against the people of Morgantown and Monongalia County. If the ballpark must be built by the TIF plan, the County Commission should do something sensible, or at least something not crooked, something that would even benefit WVU. 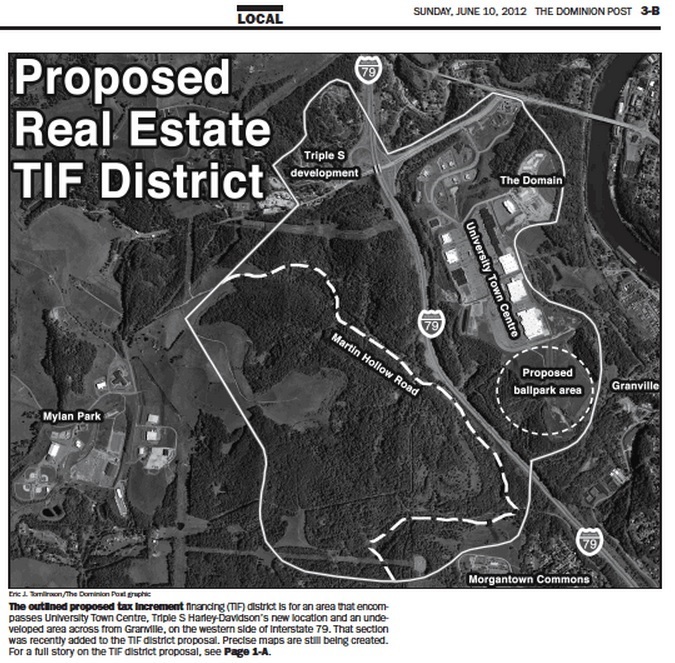 The County Commission should allocate $2.1 million of TIF monies to buy the 7 acre plot of land, so that the county or the state or some entity controlled by the county and/or state controls the land, thus guaranteeing WVU cannot legally (or speciously) expropriate the entire ballpark facility by way of owning the land beneath it. It really should not. The stadium really should go to the entities (state and county) that will pay for the stadium to be built. For that to happen, if that, by law, requires owning the land beneath the stadium, fine, the county and state will have plenty of TIF funds at their disposal to easily pay for the 7 acres. Therefore, the stadium goes to the county and/or state to own and to profit from, by operation and/or by sale. Everyone wins. WVU saves $2.1 million upfront by not having to buy the land. County TIF funds are already locked in to the TIF district and could be used, if need be, to manage the stadium, where WVU can choose to pay to play like everyone else or it can go build its own multi-million dollar stadium as it wishes, rather than swindling the public out of millions. If the Monongalia County Commissioners cannot build a multi-million dollar ballfield facility that is monetarily and otherwise worthwhile for public use and worth multi-millions upon any sale, then the Commissioners have no business being in charge of the public’s money in the first place, and the two commissioners who voted for the “Ballpark TIF” might as well be removed from office at the next election. Unless of course the election options are worse than no better. In that case, the happy picking of the public’s pocket will continue. See article of April 23, 2013 in the Dominion Post.